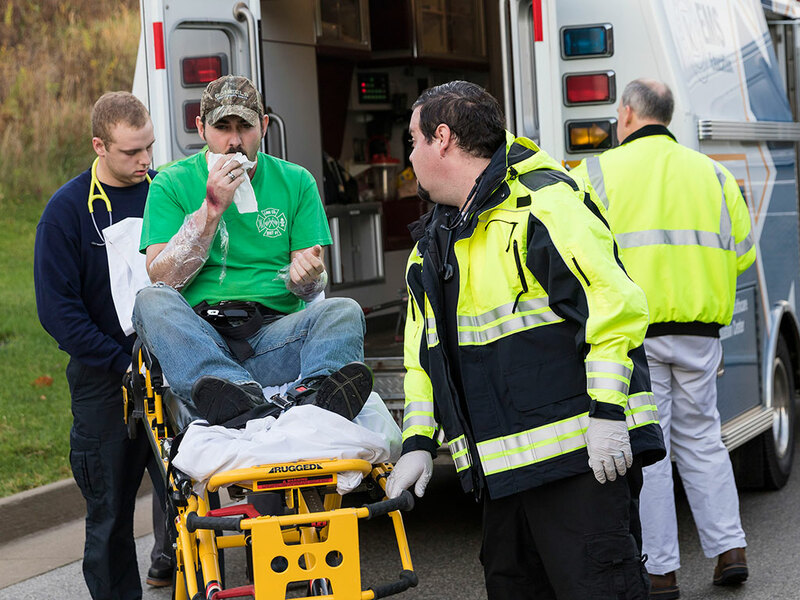 Kirkwood EMT students take part in a medical emergency training session in the fall of 2016. CEDAR RAPIDS, Iowa (July 24, 2017)—Kirkwood Community College’s Health 411: A Conference for Health Professionals will take place Friday, August 4. The one-day event will focus on addiction, concussions, telemedicine and vision therapy. Opioid and heroin addiction in the United States is raging in epidemic proportions. Iowa is not immune. Cedar Rapids Police Officer Al Fear with the Eastern Iowa Heroin Initiative will provide insight to the local problem, including what to expect in the next two years. Discussion will include the significance of Iowa’s Prescription Monitoring Program established in 2006. The Centers for Disease Control reports that each year more than 170,000 kids and teens visit the emergency department for sports- or recreation-related traumatic brain injuries, including concussions. Paramedic and firefighter Andrea Zickmund, Indiana’s primary educator on sports injuries and concussions will present. Providers will learn how to recognize midface fractures; treat concussions prior to arriving at the hospital; and gain understanding in the rise of sudden cardiac arrest among otherwise healthy athletes. Over half of all U.S. hospitals use some form of remote healthcare technology, according to the American Telemedicine Association. This facilitates patient care in rural areas and promotes 24/7 care. Dr. Timothy Sagers will discuss the impact of telehealth in Eastern Iowa and its relevance to all healthcare providers. Vision disorders frequently are masked by other health conditions, like autism, or confused due to overlapping symptoms. Dr. Kara Heying will review the most common disorders and explain simple screening tools and therapeutic techniques.